TCU's Human-Animal Relationships minor is a collaboration of the arts, sciences and humanites departments. Above, TCU alumna Reilly Jo Cavanaugh and a baby rhino in South Africa. Photos courtesy of TCU. A North Texas university is offering an educational track that Dr. Doolittle would love. In a first for the state, Texas Christian University in Fort Worth launched a minor program that explores the relationships between humans and animals. TCU’s Human-Animal Relationships minor is an interdisciplinary program that draws from the arts, sciences and humanities as it delves into how human and nonhuman persons interact and what value these relationships have for both people and animals. Among the ideas that the two-year-old program explores are why we consider humans to be superior to all other animals, how our perspective affects our behavior toward both animals and other humans, and the role animals have played in our culture throughout history. Dr. David Aftandilian is director of TCU's Human Animal Relationships program. 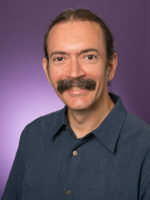 TCU associate professor of anthropology David Aftandilian is director of the new program and says developing the minor was a collaborative effort among faculty who wanted to expand on various animal-related courses that were already being offered while adding new classes to fill in the gaps. “A sociologist named Carol Thompson who's been teaching a course here at TCU on animals in society for several decades [has] long had a dream of having an academic program related to the social and humanities study of animals. I'm in anthropology but mainly what I research and teach is about religion and the environment - animals and religion. And then we had several partners in the social work program, which is in a different college, and their students were very interested in learning more about animal assisted therapy - using animals to help people basically. So, we started that, but then we’re also very close partners with the environmental science program here at TCU. They've been very supportive, and as things have developed, it's a solidly interdisciplinary minor. We have classes offered in more than a dozen different programs [and] multiple colleges here at TCU,” he says. Aftandilian says that what distinguishes the new program from animal-related coursework that’s been offered for decades at the university comes down to perspective. 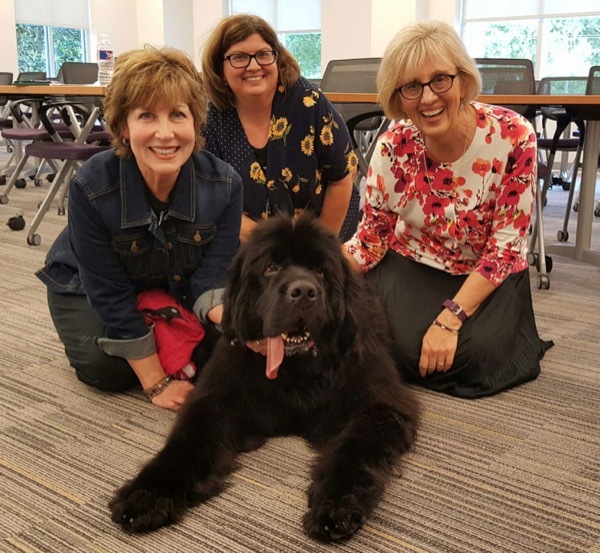 TCU animal assisted therapy instructor Diana Davis, center, with SOWO faculty, therapy dog team and therapy dog. Aftandilian says we often underestimate how much our lives are affected by animals and the extent to which they provide us companionship, help us cope with troubling matters and generally make our lives whole. Aftandilian says animals can either suffer horribly or enjoy a pleasant life depending on how we view them. If we see animals as commodities that have value only for what they can give us, as is often the case among so-called farm animals, we forget that they can sense pain, feel sick and live a life full of misery and fear. On the other hand, if we see them as nonhuman persons, we open our minds up to understanding that what they want in life is precisely what we seek. Additionally, Aftandilian says the program helps students to momentarily set aside the self-serving tendency to see ourselves as superior by using standards that we humans already measure up to. Instead, students explore the unique characteristics and abilities among animals that set them apart as experts in their own right. “Animals are a kind of person - not that they’re little humans, but that they have their own point of view on the world. They have their own subjective experience. They are individuals who are worthy of our concern and care." Aftandilian says the exercise of opening one’s mind to traits of other beings being different, not inferior, is essential for each of us to overcome the sense of “othering” we develop early on in infancy. We instinctively assume that “I am something and then the other being is something else,” he says. “The problem is that that othering is often used to divide and to make the other being less than [ourselves]. It’s that othering that actually starts with the human-animal binary [we develop growing up] and then ramifies into men, women, people with other gender identities and men being taken as the best and the others have lesser [importance]. It’s the same thing with whites versus people of other ethnicities. It all starts with a skewed view of human-animal relationships. So that's the sort of thinking that we try to bring to light,” Aftandilian says. Aftandilian says the coursework lays out a broad foundation for a wide variety of careers that students may undertake, and that students who’ve signed up so far have plans to enter the fields of animal law, canine search and rescue, and social work, along with other pursuits. “We have a lot of pre-veterinary students,” he adds. The minor has only one required class that all students must take. The rest of the coursework is self-directed. “The formal requirement is [a class called] Perspectives in Human-Animal Relationships. And it's an overview, but the student can take it anytime it's convenient. They could start with it. They could end with it. They could do it in the middle. They need to take then five other classes, and they can take no more than two in any one program, so two anthropology, two social work, and so forth. So the idea is there is that they'll get some breadth [of exposure],” Aftandilian says. “Before we started, we wanted to make sure that we had enough courses already being offered that we could just move on and the students would have a good variety to choose from. So, there was already some existing stuff, but there's also been a lot that's been created for the minor. Ceramics professor Chris Powell created a course called Making Animal Imagery specifically for the minor. Studio arts majors can and do take it, but he created it for us. The chair of nutritional sciences at TCU, Anne Vanbeber created a course on vegan and plant-based food studies. So partly that course teaches students how to do vegan cooking. And again, it was created for us, although nutritional sciences students can and do take it. There was a course on nonhuman rhetorics that was created largely for our program in the English department. I co-teach a class that we created with another studio art professor called Into the Small: Little Animals in Art, Culture and Museums. There is a course in philosophy that was created for this program, essentially on cognition and consciousness from a philosophical perspective and a good chunk of it is about animals,” Aftandilian says. Aftandilian says the program hosts brief presentations on campus that highlight animal-related topics and invites animal professionals to share their perspective. Often, the events are open to the general public. “We've partnered for the last two years with our Office of Religious and Spiritual Life to host a blessing of the animals on campus. That’s around St. Francis’s feast day in October. We also often partner with our international film series here, Kinomonda [Global Cinema Project], to show animal films. For example, we showed Kedi, about the stray cats of Istanbul. We have also cosponsored screenings of Okja and The Story of the Weeping Camel. We introduce the film and give it some animal context. Those are open to the public, so they'll have a little educational value as well,” Aftandilian says. Watch the trailer of Kedi, a 2016 Turkish documentary about the stray cats of Istanbul. When the minor was first offered in the fall of 2016, only three students participated. By the spring of 2019, the number of students in the program rose to more than 30. Aftandilian says the coursework’s ability to open students’ minds to see from other being’s perspective is an exercise suitable for every major because it has broad implications for our own human-to-human interactions.